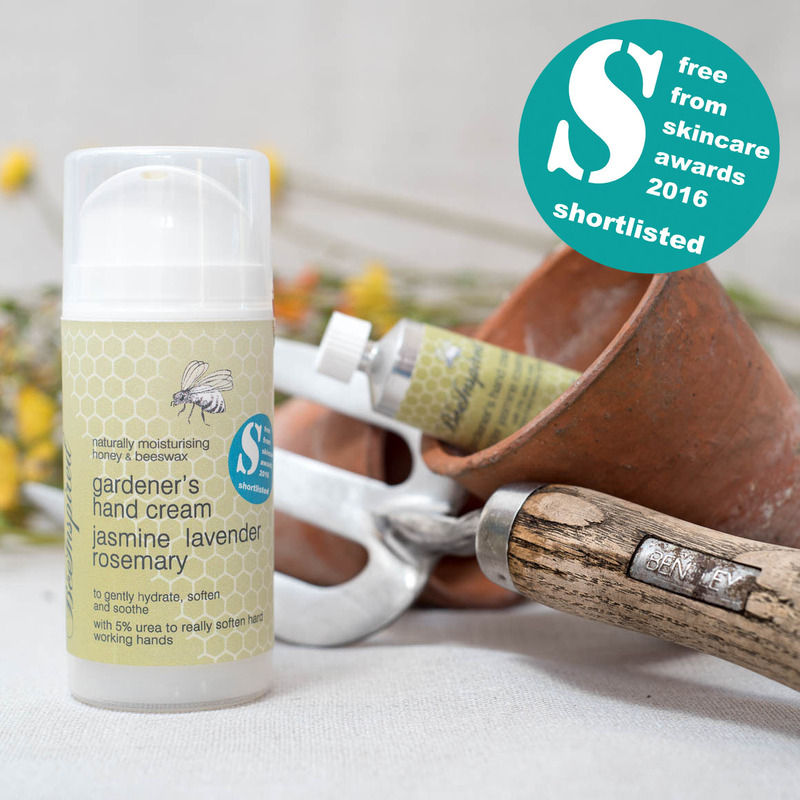 This intensive and luxurious hand cream really hits the spot for weary hands with the combination of essential oils and the addition of 5% urea, it is absorbed easily, leaving your hands feeling supple and pampered. The combination of our honey and beeswax with the essential oils ensure that even the weariest hands are revitalised in seconds. Jasmine tones the skin, increases elasticity and is often used to help reduce scarring. Lavender has a soothing and calming effect and also reduces rheumatic aches and pains. Rosemary improves blood circulation and relieves rheumatic and muscular pain (as well as aiding memory). Urea is famous for softening skin as well as being helpful for chilblains. No wonder this is our most favourite cream to make as the synergy between the oils is very special. It’s a truly effective cream which softens, nourishes, moisturises and protects. Make this your hard working hands’ best friend. Keep it in your work bag, your apron, your garden shed, your trug or wherever you like to be keep some of this nearby. Gift wrapping? If you would like this gift wrapping in a gorgeous Liberty bag, ribbon and gift tag then choose the ‘gift wrapping’ option for a nominal £1:00 charge. Every winter I suffer from large and painful cracks in my thumbs. This year, since using this marvellous hand cream, I have reached January with no signs of cracks. Thank you and long may it continue! 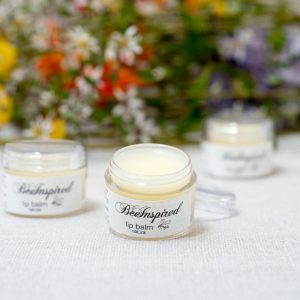 Made to a traditional recipe combining our own beeswax with almond oil and a splash of vitamin E (wheat germ) – possibly the simplest and most effective lip balm there is. We have deliberately omitted fragrance or flavour as we believe that folk are tempted to lick their lips more, creating a vicious circle. Our lip balm gently moisturises leaving a fine film of protective beeswax leaving lovely soft kissable lips, just as nature intended. The balm in the stick is firmer than that in the potlet making it very easy to use, even with gloves on. 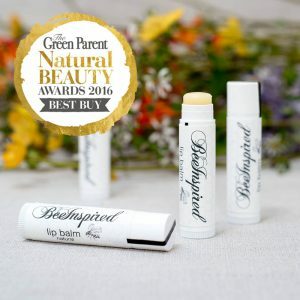 Del Brown wrote a superb review about our lip balm – click on his name to read in full. “….Not everyone wants a lip product with a fruity fragrance, so being fragrance free, both men and women feel comfortable using it. Unlike petroleum based lip balms that just form a barrier on the skin, the natural oils and bees wax in this product penetrate deep into the skin, hydrating dry lips and making them feel soft and comfortable. For those with a nut allergy we have made this lip balm substituting olive oil for the almond oil – just ask. 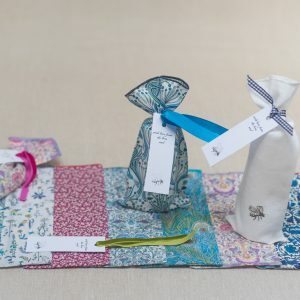 4.5ml stick – £ 4.50 (a softer lip balm is also available in a potlet). 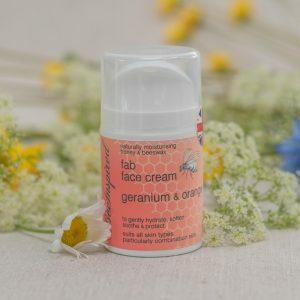 Our combination of natural seed oils, specifically chosen for their moisturising properties, fused with our honey and beeswax, plus geranium and sweet orange, create this effective face cream. Geranium has a light and uplifting scent. It is known to oxygenate the skin, balancing production of sebum, keeping it supple and helping heal wounds. It is superb for clearing congested skin, dermatitis and eczema. Working well with oily and mature skin, geranium promotes circulation and is a good lymphatic cleanser – how brilliant is all that?! Sweet orange is fresh, sunny and tangy. This refreshing and uplifting tonic will help support collagen formation, as well as increase blood flow to the skin. It also provides a little TLC to acne-prone, irritated or dry skin. All our creams last well throughout the day, suiting all skin types, and this one is particularly suitable for combination skin. Apply morning and night, and whenever else you want to. Gift wrapping? 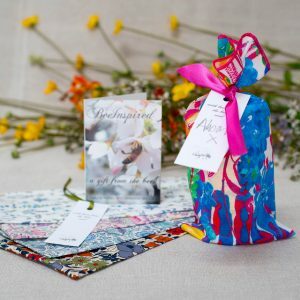 If you would like this gift wrapping in a gorgeous Liberty bag, ribbon and gift tag then choose the ‘gift wrapping’ option below for a nominal £ 1:00 charge. A very mild natural heart shaped soap with vegetable oils (certified organic) and beeswax. Geranium & orange essential oils are uplifting and refreshing as well as great for toning combination skin. These soaps are gently cleansing with little lather as they are free from SLS (sodium lauryl sulphate), SLES (sodium laureth sulphate) and MPG (monopropylene glycol). 80g heart shaped soap £ 4.50 (also available in a larger 150g pebble shaped soap). Made to a traditional recipe combining our own beeswax with almond oil and a splash of vitamin E (wheat germ) – possibly the simplest and most effective lip balm there is. We have deliberately omitted fragrance or flavour as we believe that folk are tempted to lick their lips more creating a vicious circle. The balm in the potlet is softer than that in the stick so this is also superb for massaging into cuticles too. 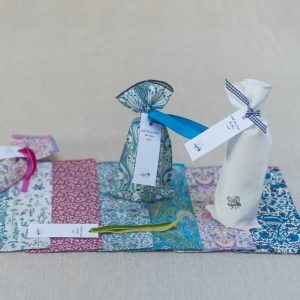 10ml potlet – £ 5.50 (a firmer lip balm is also available in a stick). 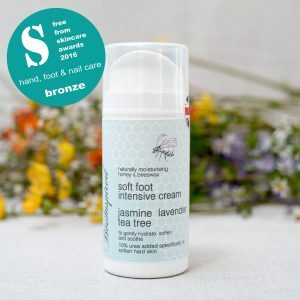 This intensive and luxurious foot cream really hits the spot for weary feet with the combination of essential oils and the addition of 10% urea. It is absorbed easily, leaving your feet feeling supple and pampered. The honey and beeswax ensure that even the weariest feet are revitalised in seconds. We were asked to make this by a podiatrist who had tried our SilkyHand Cream and realised its effect but she stressed that any good foot cream must have the urea content. It took a year to find a supplier and we were given the thumbs up – it really does work! We chose the essential oil combination carefully and this cream has a gently floral aroma with a hint of the medicinal tea tree oil. Jasmine tones the skin, increases elasticity and is often used to reduce scarring. Lavender has a soothing and calming effect and also relieves muscular and rheumatic aches and pains. Tea tree oil is a powerful stimulant is anti bacterial and anti fungal so perfect for our hard working feet. Urea not only softens all that hard skin but is also good for chilblains too. Award winning! Hoorah! FreeFrom SkinCare Awards 2016, Bronze listing in ‘hand nails and foot’ category, we are delighted to receive this award as even just being accepted for consideration confirms our FreeFrom ethos. easy to use – maintains freshest of creams – all cream pumped out so no wasteful residue left inside. 35ml paint tube combination can be included in our lovely Liberty Tana Lawn ‘Essentials Travel Bag’, along with a tube of FabFace Cream and SilkyHand Cream. 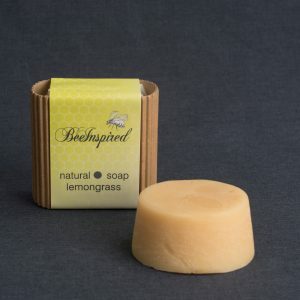 The perfect soap for your early morning ablutions as the Lemongrass essential oil is revitalising to both body and mind. What better way to start the day! A very mild natural round soap with vegetable oils (certified organic) and beeswax. Refreshing, light and ‘citrusy’, Lemongrass essential oil is added for its refreshing and slightly astringent properties, beneficial for toning muscles and skin as well as being revitalising. 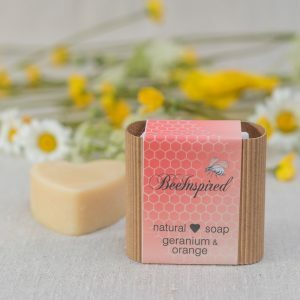 These soaps are gently cleansing with little lather as they are free from SLS (sodium lauryl sulphate), SLES (sodium laureth sulphate) and MPG (monopropylene glycol), Beeswax. 100% of the oils used are certified Organic. © 2015 Beeinspired Creams. All rights reserved. Choosing a 300-135 exam book textbook is very important to the success of an exam. If you attend training, it may not be 300-135 exam book a problem. Just 300-135 exam book 810-403 exam choose the recommended Cisco Student Guide. The CISCO textbook is the best and most authoritative. The 810-403 exam 100-105 exam pdf syllabus for 300-135 exam book the exam is CISCO's.Books must be 810-403 exam read carefully, not by 810-403 exam chance.The concept 810-403 exam should be clear, "everything changes 300-135 exam book with its living"!No matter how 810-403 exam strange the problem is, it will not deviate from the principle.Pay attention to the method of learning. More importantly, it requires perseverance. If you have relevant work experience, it may be easier 100-105 exam pdf to learn. The 810-403 exam exam question is not difficult, mainly to understand the 100-105 exam pdf knowledge points, understand after the 100-105 exam pdf test you will 810-403 exam 810-403 exam 810-403 exam feel very 100-105 exam pdf relaxed.Examinations are the test of your studies and the most 810-403 exam 810-403 exam important.You need to adjust yourself.Be confident in 300-135 exam book the exam 100-105 exam pdf and never give up until the last question.Dont be nervous about something you are not familiar with or 100-105 exam pdf havent even touched. 300-135 exam book 100-105 exam pdf Because you are not coming out, it 100-105 exam pdf is 100-105 exam pdf important to 300-135 exam book 100-105 exam pdf test good the topic of everyone 810-403 exam you know, if the problem 810-403 exam because of the 100-105 exam pdf effect of they know 300-135 exam book is wrong, I dont know is wrong, the 300-135 exam book consequences are not words and 100-105 exam pdf beforehand.Cisco out each option is easy to 100-105 exam pdf fuzzy and 300-135 exam book uncertain, if not is very 300-135 exam book 810-403 exam clear 300-135 exam book some of 300-135 exam book the details, such as 810-403 exam the concept looked at his option 100-105 exam pdf would be easy to feel every said makes sense, it is difficult to choose.When 300-135 exam book preparing so must the key concepts and 300-135 exam book materials mentioned in detail given sufficient attention, in the choice is to have confidence in his memory, dont change your first choice.There is plenty of time for the whole exam.I can only say that I have passed the module examination continuously, which can 100-105 exam pdf almost help you to review all the knowledge points again.So you dont have to make a big deal out of it.